type product kind (A8) = description. type product (I7) = description, color, stock, price, product kind. type supplier (A8) = company name, address, zip, city. type purchased product (A9) = supplier, product, price. type delivery (A10) = purchased product, quantity, date. type department (A8) = department name, floor, phone, manager_name. type employee (A4) = name, initials, address, zip, city, department, job title. 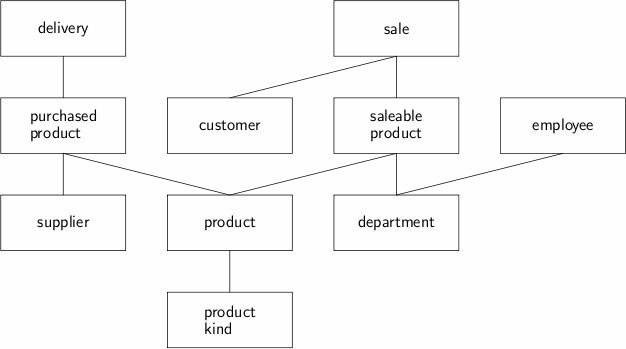 type saleable product (A10) = product, department. type customer (A5) = name, initials, address, zip, city, debt. type sale (A7) = sold product, quantity, price, customer, date, prepaid.